As one of the frontrunners [if not THE frontrunner] for this year’s Best Picture, 12 Years A Slave was always facing an uphill battle maneuvering through controversies and studio politics. It’s an intense and beautifully done film, but it also deals with sensitive [albeit essential] subject matter. But there’s no excuse for this. 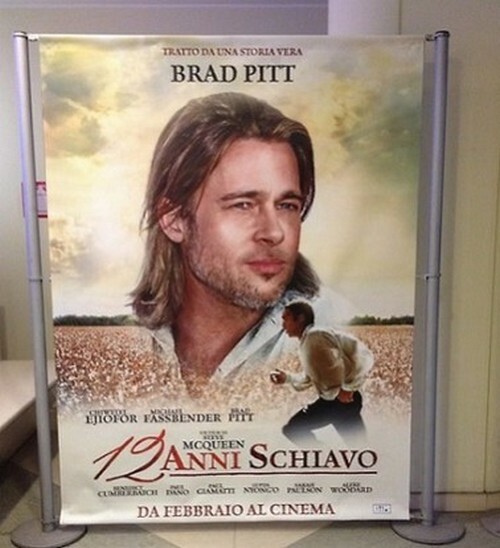 The Italian distributor for 12 Years A Slave decided to promote the movie with posters that emphasized their white actors over their LEAD black actor. Chiwetel Ejiofer is the indisputable star of the movie, present in almost every frame. The movie is literally based on his character, based on the autobiography of the same name. So instead of promoting the movie as what is it – a drama about a black slave trying to get free, the posters instead make it seem as though Brad Pitt and Michael Fassbender are the leads of the film. First of all, Brad is present for pretty much five minutes of the film, in total. Fassbender, while he has a larger role, still doesn’t even come close to the amount of screen time that Ejiofer has. Ok, fine, so some people can argue that Brad Pitt is a massive movie star and the distributors are doing whatever they can to sell the movie. Fine, I’ll accept that argument. But why Michael Fassbender? He has nowhere near the clout of Brad Pitt, even if he is more popular in Europe than other international countries. He’s proved that he doesn’t exactly have enough of a name to open movies [cough, The Counselor, cough]. Anyway, more and more, audiences are starting to prove that they don’t care about movie stars. Even movies with A-list stars like Tom Cruise and Will Smith are starting to fail on a regular basis. So even if their marketing ploy works, it’s not going to be because of the posters; it’s going to be because 12 Years is a damn good movie that generates excellent word of mouth. Brad Pitt Announces Retirement After “12 Years A Slave” Gets Rave Reviews at the Toronto Film Festival?